He lived in the shadow of the Long Fellow. But was he Mr Big? 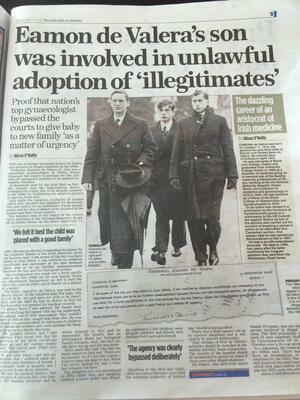 Yesterday’s Irish Mail on Sunday published a letter from the late Eamon de Valera, Professor of Gynaecology, University College Dublin showing him to have been involved in the illegal adoption of babies in the 1960s, such adoption having taken place by way of the issue of a birth certificate in the name of the adoptive parents. The practice of adoption by falsified birth certificates was discussed by Mike Milotte’ in his book ‘Banished Babies‘, (New Island) in which he records the garda investigation and subsequent prosecution,in 1965, of Mary Keating, proprietress of St Rita’s Nursing Home Donnybrook, Dublin 4 for falsely registering the birth of a baby in her care. “[The Gardai] had their sights on a man whom they believed to be behind a major baby selling racket that had gone on undetected for a number of years, and that had involved the illegal dispatch of many babies to America. The man, who had a public profile, was never charged with any offence, although it was always suspected that it was he, and not Mrs Keating, who was the principal beneficiary of the scam. Mrs Keating was clearly well-connected. Declan Costello, future Attorney-General, appeared for her her trial, and Karl Mullen, gynaecologist, rugby star and grandfather of Cian and Pippa O’Connor, gave evidence of her good character. Although many children of unmarried mothers were adopted in the 1960s, with and without the help of gynaecologists, St Rita’s adoptions were unique, or almost unique, in offering the adoptive parents a birth certificate in their own names. Was the child the subject of the Irish Mail on Sunday article born at St Rita’s? And, if so, what was Professor de Valera’s association with this institution? Read Sibling of Daedalus’ and newly-updated Irish history blog here. Posted in Misc and tagged Eamon De Valera at 5:15 pm on February 2, 2015 by Admin. Sorry for being really stupid here but…. ….or is the Mail on Sunday saying it? Just setting the context against which Mr de Valera’s letter should be viewed. Illegal adoption in Ireland was a nefarious business. I see at least two potential candidates for Mr Big, I am sure there were more. A darker “gravatar” for 2015 Sib? What can this mean? A dark country, Otis. Hopefully the clouds will clear, at some point. Am I right in thinking that this issue was skirted round in one of Banville / Benjamin Black’s novels (adapted by RTE into Quirke)? Christine Falls, if memory serves. It was alleged that the powers behind such trafficking were high ones indeed. yep thats correct. i read it sometime ago and thought it was very close to the bone i.e. Medical chap up to his elbows in the whole sordid affair…. Quirke’s brother was behind it – with support from their father…. (Michael Gambon)… anyway, I wonder what the long fellow knew? Can’t someone think of the comely maidens dancing at the crossroads? You just have to hit the right degree of comeliness. Yes. I think Banville drew heavily on Milotte’s book for Christine Falls. The DPP is the establishments method of making sure only ordinary unconnected people are prosecuted for serious crimes such as fraud, abuse and other non lethal offenses. Murder is hard to fob off but they would try. Ireland is a small little principality of connected people. If you keep voting for FFFG, that will never change. That would explain the food in the Four Courts canteen. That explains it. All very odd, and decidedly dodgy. Dev jnr was a doctor, a gynecologist. This would have been in pre-contraceptive Ireland, not unusual to have 10+ kids and no means to support them. Lot of kids ended up farmed out to relatives or in institutions because of poverty. Lot of hypocrisy still coming out from that era. It’s like the plot from series 3 of Sons of Anarchy. I thought that was far fetched at the time. I guess it wasn’t. Considering how the de Valera family enriched themselves through the Irish Press Group by by-passing ordinary shareholder, this must’ve been small change for that family. Dev would’ve been President through this period 1959-73) and his family pretty untouchable. …and there are some people who still believe the reason Dev Snr wasn’t shot in 1916 was because he was an American citizen? Dev’s family were heavily connected to The Rollin’ 60 Crips and that is why he wasn’t shot. No, no, no, no, no… that’s DeValera’s family. They do no wrong. records County Local Boards of Public Health as they were then.